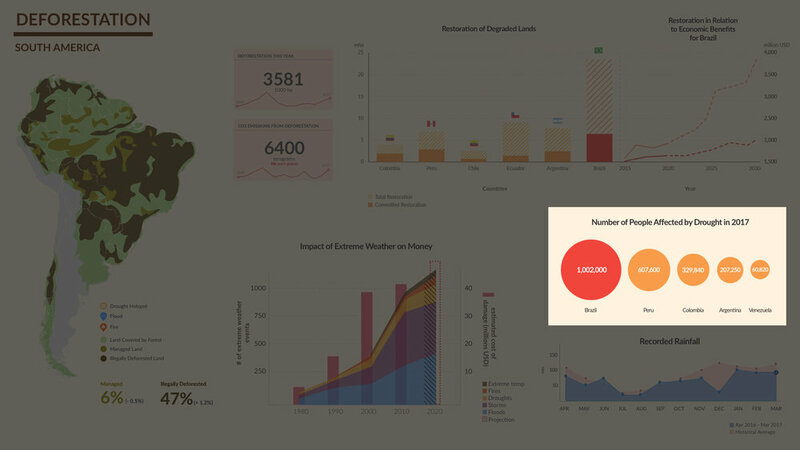 Data-driven dashboard capturing the pressing concerns of deforestation in South America and its implications on economic loss and human factors. 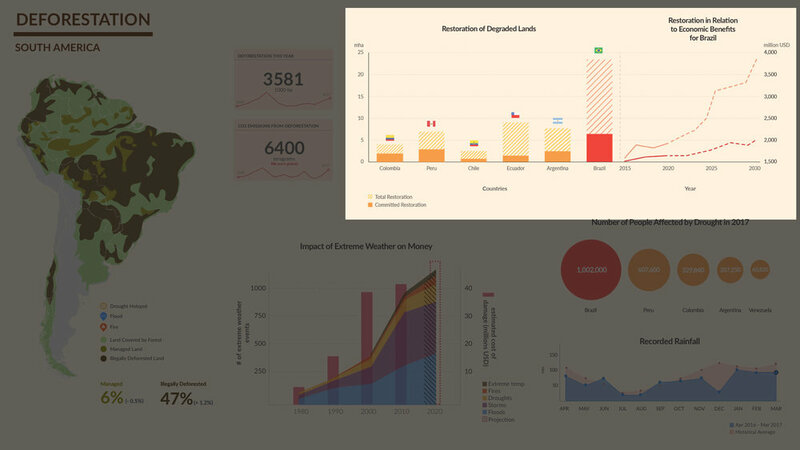 Our team’s task was to create a data-driven dashboard with animations to capture South America biodiversity data and compel policymakers to make decisions and create new policies to help support these factors. 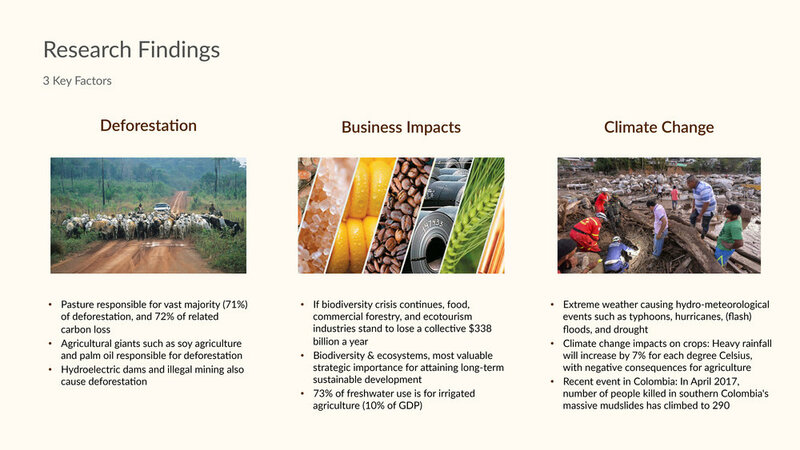 We went through multiple iterations of our dashboard to distill the complex factors that surrounded biodiversity in South America, and found that problems around deforestation was the most alarming, which we based our dashboard narrative on. Our solution captures the raw deforestation and carbon loss data, connect this with important implications for these countries, such as economic loss and affected human livelihoods, and provide actionable opportunities for policy makers with data to help them understand why creating policies immediately is so urgent. We conducted our research in the 3 main domain areas surround deforestation: deforestation factors, business impacts, and climate change impacts. We then tried to connect the dots by consolidating our research and all the relevant pieces of data that we had found into a compelling narrative. In order to so, we thought of the problem of deforestation from the conservation scientist's point of view and what needs to be achieved in order to convince the policy makers to take actionable measures. Then we went back to narrow down our story into 3 segments: cause, result, and implications. We mapped our factors to this storyline, and prioritized them based on what would be most important to policy makers. The color coded map allows monitoring managed and illegally deforested lands and shows extreme whether events happening in South America with icons. The map animates when new forest fires, floods, or droughts occur to call out there are important events happening. The animation shows relationship between drought in South America and the number of people affected by the drought. It animates the real time impacts of a drought growing and the number of people affected by the drought. These boxes show two factors of deforestation and CO2 emissions with a trendline from the past 17 years on the bottom for quick glance-ability of where current rate stands. This animation shows the two factors that change in real-time and the correlation between two factors. It shows the increasing trend in extreme weather events over time and cost of damage. Drought is called out because it is one of the most impactful extreme weather events on South America currently. The call out shows projected money loss in soybean, crops and beef. 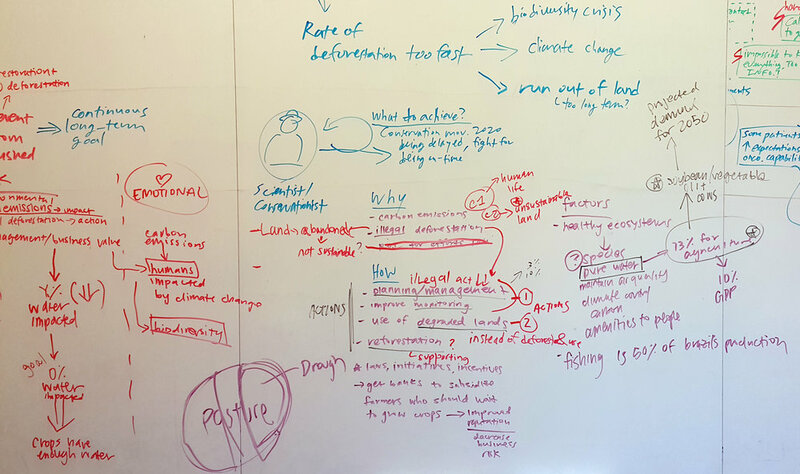 Throughout this 4 week process, we struggled to find a balance between our two personas and the many factors surrounding biodiversity for a viable solution. 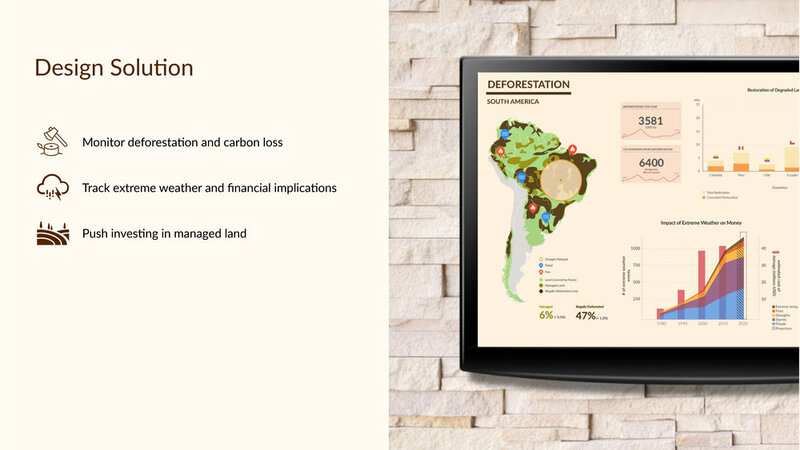 However, through modeling and iteration, we believe we distilled a small enough scope with a powerful narrative to deliver a dashboard representing deforestation in South America. Had we had more time, we would have looked at how this dashboard may change day to day with the information, and how the country buy-ins for Initiative 20x20 would animate.